Our family is moving. Is there cause for concern for my dog? Most dogs seem to take moving in their stride, but for some dogs the loss of their familiar home and routine can be traumatic, and settling in to the new home can pose problems for owners and dog alike. "Dogs are generally quite content as long as their social group (people, other pets) remains fairly much the same ..."
Dogs are generally quite content as long as their social group (people, other pets) remains fairly much the same and as long as the daily program (routine) remains fairly constant. Pets with specific locations in the home for sleeping and eating may have some temporary difficulty in adapting until they develop similar locations and routines in the new home. However, when introduced into a household where there are unfamiliar pets or people or where the daily routine is dramatically different, problems might arise. If the dog is being introduced to a home where there are other pets, then there are additional concerns about how the pets might get along, based on previous exposure to (or familiarity with) other pets of the same species, as well as how the individual pets interact. There are 3 main issues to consider; the change in routine, the new home itself and other pets or people in the new household. How can I prepare for the move? To help your dog best adapt to any change in daily routine, changes in scheduling and how family members might interact should begin prior to the move. If the dog is not already on a fairly structured daily program of feeding, exercise, play, training and down-times (such as resting, self-play and naps) then it can be very helpful to introduce a more predictable daily routine which can also be provided in the new home. Older dogs, pets with chronic illnesses, and those that have had a very constant lifestyle may be more sensitive to change. Drugs and special therapeutic diets for the treatment of brain aging may be helpful in these pets. While you are preparing for the house move, it may be advisable to keep the boxes and suitcases out of view and to pack up the pet's sleeping areas last, so that the home remains as constant as possible. Obviously there comes a point where the packing cannot be hidden. At this point, if your dog seems overly anxious, or you cannot pay sufficient attention to your pet, then it might be best to have someone care for your dog while you are packing and dismantling the home. Alternately, if you have the time, it might be possible to desensitize and countercondition the dog to the boxes and household disruption by providing favored toys, treats and play sessions in conjunction with the packing. 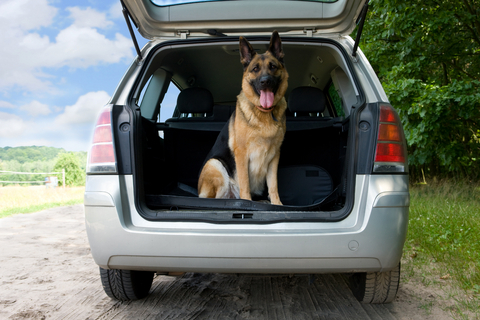 During the actual moving the dog should be securely confined or out of the home to avoid anxiety, injury or escape. How can I help my dog become more quickly accustomed to the new home? Your dog should be provided with an environment which has all the amenities and as much similarity as possible to the previous home, especially with regard to the dog's sleeping, feeding and play areas. Therefore if the dog does not have a specific bed for sleeping or a specific location for eating it might be helpful to establish these before moving, and then to set up the similar sleeping, bedding and feeding routines when moving into the new home. How should I introduce my dog to the new house? If there are no new pets and no unfamiliar people in the new home, then there may be minimal problems if the routine has been previously established and the dog is accompanied to his food bowls, play toys and sleeping areas. Of course, if a dog bed or crate has been used in the previous home, then this may help the dog to better adapt. However, it is best to accompany the dog to these areas and spend some time with the dog in the new home for the first few days until it has developed some familiarity with its new environment. Young dogs in particular that are given the opportunity to explore new areas may have a propensity to chew as part of their investigative behavior, while some dogs may tend to mark their territory with urine. Therefore accompanying the dog while it explores provides an opportunity to encourage and reinforce desirable behavior while interrupting or deterring undesirable behavior. Another concern is that pets are excellent at reading body signals and emotions so that any anxiety on your part may add to the pet's anxiety, while a happy and upbeat mood might help reduce any associated anxiety in your pet. As you unpack it might also be advisable to restrict your dog's access only to those rooms that are already set up. If you want to have your dog accompany you in the unpacking area, be certain that the dog is well supervised or entertained with some enjoyable distractions (treats, favored toys). As dogs are strongly scent oriented, the opportunity to investigate new odors, to identify familiar odors and to spread their own odors gradually through playing and exploring of each room can be an important aspect of becoming familiar and comfortable with the new home. The pheromone diffuser, DAP® might help your dog to more quickly settle into its new home. How long will my dog take to settle in at the new house? "Play toys, affection sessions, and food treats can help the pet to make the move to the new home a positive experience ..."
Play toys, affection sessions, and food treats can help the pet to make the move to the new home a positive experience, as long as they are used to reinforce acceptable responses (calm, relaxed, inquisitive). For example a few new play toys and a special treat given when the dog appears calm or settled into its favored sleeping area can be very helpful in encouraging the pet to settle down and relax. Be certain to offer regular periods of play and exercise to insure that the dog's social and energy needs are met. When first leaving the dog alone in the new home, it would be best to match the time when you depart with a time when the pet is normally sleeping or playing with its own toys, and increase time alone gradually, allowing the dog to adapt. I am moving into a household that has other pets, adults or children with which my dog is unfamiliar. How can I prepare in advance? No doubt the biggest concern would be the introduction of your dog to new family members or other pets. This may be of little concern if all pets have been previously well socialized to a variety of people and other pets, so that the fear and anxiety associated with the first few interactions can be minimized. This might be accomplished by introducing your dog to these people and pets in a neutral environment to assess how they get along. Keeping the pet on leash is helpful and safer for your pet. Providing play and treats during the introductions can help to insure a positive outcome. However, pets that are fearful, aggressive, or overly playful and inquisitive when they meet other pets or new people, may need some time, effort and additional training to help them adapt. If problems should arise, it is important that your dog responds appropriately to some simple cues and commands, and that you have good physical control. Therefore, take some time to train your dog or review any previous training, and consider introducing additional control devices such as a head halter if you do not have sufficient verbal control. You can minimize problems if your dog is trained to respond promptly to key verbal commands such as a settle-down or focus command, to heel or follow calmly on walks, to go to a bed or other settle down location on command and to relax during a long down-stay. Your goal is to ensure a positive outcome for your dog. Punishment of undesirable behaviors might escalate anxiety and aggression. Head halter training is an excellent means of insuring an immediate response while controlling the head and muzzle. If you have any concerns about the potential for aggression in the new home, this would be an appropriate time to begin to train your dog to accept and wear a basket muzzle (see our handout on 'Training Products for Dogs – Muzzle Training'). If your dog is comfortable in a crate, it can be used as a safe place for the dog in the new environment. For information on crate training see our handout on crate training. How difficult will it be to introduce my dog to the existing pets in the new home? How your pet will get along with other pets in the new home and how quickly problems may be overcome is virtually impossible to predict. New relationships will be based on a wide variety of factors including sociability with people of all ages and stages of life, previous familiarity with other dogs and cats, how the pet historically gets along with other dogs and cats, which pet if any is preexisting in the household, how the existing pets react to new animals on their property, and the specific factors that are unique to each relationship. For the safety of all pets, they should be separated when not supervised either using barriers or crates (if the dogs are pre-trained to rest calmly in a crate). How do I introduce my dog to other dogs? When introducing a dog into a home with new dogs, it might be best to have dogs interact with each other on neutral territory on more than one occasion. This will allow you to determine whether there might be any problems. On the day of the move, take the dogs for a walk together and have a play session before returning to the new home. It is advisable to avoid items of possible competition and contention from the outset, such as food toys and treats, except when the pets are separated or entirely supervised. Providing a separate feeding area and sleeping area for each pet may be advisable at first, until it is established that there is minimal anxiety or competition over these resources. When the dogs are together, a leash and head halter is often the best way of insuring a positive and gradual introduction, while providing sufficient control should problems arise. "By saving favored toys, treats and affection for times of interaction, a positive association with the presence of the other pet can be more quickly established." Desirable responses should immediately be reinforced, while undesirable responses should be immediately interrupted, avoiding the problem situation until the dogs can become more gradually accustomed to their new living arrangements. By saving favored toys, treats and affection for times of interaction, a positive association with the presence of the other pet can be more quickly established. Should anxiety or excitement escalate, punishment and fear-evoking techniques must entirely be avoided. The goal is to settle the dog in the presence of the other dog and reward acceptable responses. (For the treatment of problems between dogs in the home see our handout on 'Aggression in Dogs – Sibling Rivalry'). Keeping new dogs separated when unsupervised prevents problems and possible injury. How do I introduce my dog to cats? 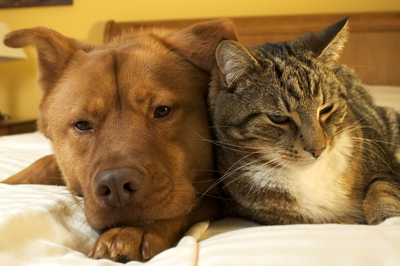 When introducing dogs to cats, both the dog's response to the cat and the cat's response to the dog must be considered. If the cat is fearful but has sufficient opportunity to escape and retreat (climbing and perching areas, cat doors) the pets may quickly learn to work things out for themselves. However the initial introduction of the dog to the household cat should be done in a controlled environment, perhaps with the dog on leash and head halter, and with favored rewards being given for acceptable responses. The cat should be provided with ample space and opportunity to climb and retreat, but if there is the potential for aggression, then control of the cat with a leash and harness might also be advisable. In simple terms the dog should be reinforced for desirable responses to the cat. In turn the cat should receive favored treats and play when exposed to the dog, to insure a positive outcome and to keep it distracted and occupied. A FeliwayTM diffuser in the home may help reduce the cat's fear and anxiety. For extreme fear or aggression between cat and dog or dog and cats, a more formal desensitization and counterconditioning program may be required, and drug therapy might be a consideration. (See handouts on 'Behavior Modification - Desensitization and Counterconditioning' and 'Fears, Phobias and Anxiety'). It may be prudent to keep the dog and cat separated unless supervised to avoid injury to either animal. How do I introduce my dog to children or family members with which it is unfamiliar? "The basic principle is to associate all that is positive in the pet's day with the new people in the household." The basic principle is to associate all that is positive in the pet's day with the new people in the household. At first these interactions, (exercise, play, treats, food, reward training) can be done concurrently with both the present and new family members. Conversely, any discipline or punishment by the new family members must be avoided. Make sure that your dog has a quiet, secure area where he can be comfortably confined if he becomes overwhelmed with the new people in the home. It also will be important for you to set aside time daily to attend to your dog's social and play needs. (Also see our handouts on 'Children and Pets').